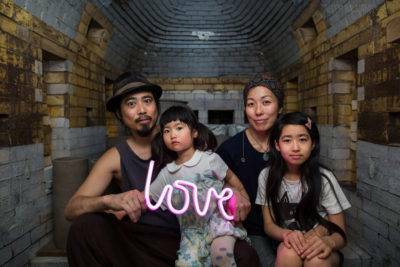 A unique and creative family that creates traditional Bizen Yaki pottery. 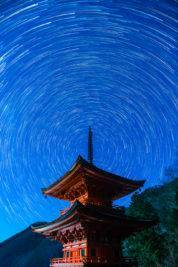 Shooting night skies at Chofukuji Temple in Okayama, Japan. Have we found a new muse? Any questions or comments feel free to hit us up here or on any of the social media platforms we are on! As always, feel free to share these images using the buttons on the left. 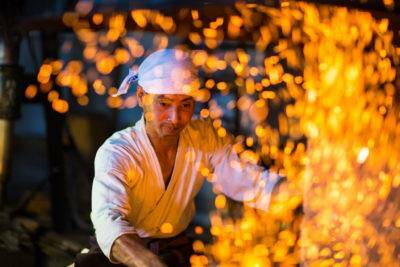 His family has been making samurai swords for 15 generations and Kazuki Kawashima carries on this legacy. 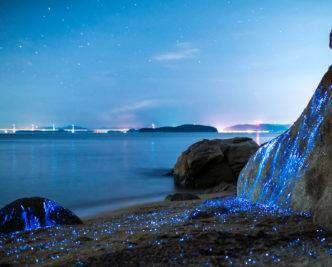 Created with bio luminescent shrimp found in the Seto Inland Sea in Okayama, Japan. Images are available for licensing here. See how we made these images here. A few months back we produced a short 30 seconds video for a Japanese shopping channel with our long term clients Daiya. We would like to wish everyone a Happy New Year and we look forward to serving clients in 2016. We would also like to take this opportunity to thank the companies that supported our special projects over the past year. It was a pleasure to meet and photograph the worlds number 2 ranked outdoor climber, Sachi Amma. 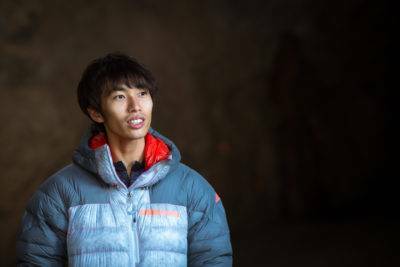 He won the 2012 and 2013 world cup lead climbing competitions cementing his place as the worlds best indoor climber before focusing on the great outdoors. He has climbed over ten routes this year alone! 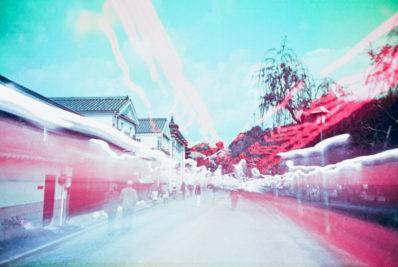 So Lomography Japan recently contacted us about testing out the yet-to-be released LOMO Instant Wide camera system with some long exposure light painting. Working with instant film for light painting sounded incredibly fun so we jumped at the chance. I am sure you are familiar with film camera king Lomography. They have been keeping film photography alive and well by producing cool film cameras and unique films to fill them with. We were contacted by them recently about working on some joint projects. I am not ready to release the full scope of the project just yet but here is a teaser. 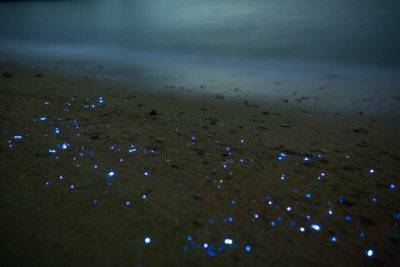 Have you ever heard of sea fireflies? We hired a boat to take us out to a remote island off the coast of Okayama, Japan to photograph these amazing creatures. 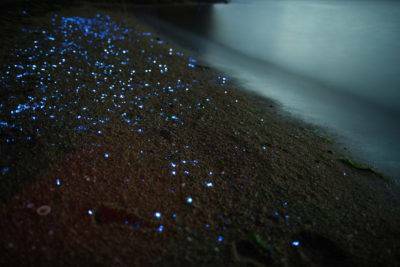 They are locally known as “umibotaru”, here in Japan, and they live on the sandy beaches of the Seto Inland Sea. 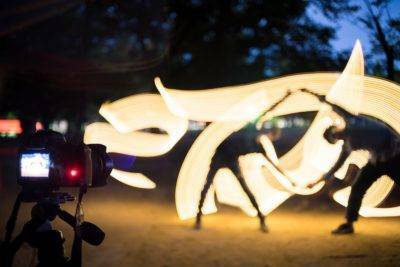 From last year we’ve teamed up with some of the world’s most talented light painters to work on a new documentary idea. The aim of the project is to revisit history through light painting. The teams go to cool locations across the planet to inspire their performances. 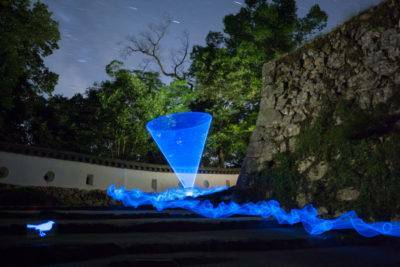 The Light Painting Seminar in Okayama was Amazing! 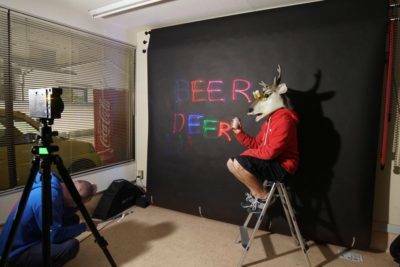 As many of you know, we hosted a light painting seminar in Okayama, Japan on September 27th. I hope we can continue this tradition for many more years! Trevor had a go at them last year and we knew right away that there were a lot more creative ways to cover this subject. The 2015 season has rolled around and we are now going to tackle these guys in a more creative way. The first thing is dialing in on a process for catching them. We recently made the long drive to Kyoto. Jon to shoot a model and some time lapse and I had a news assignment at a large movie studio. 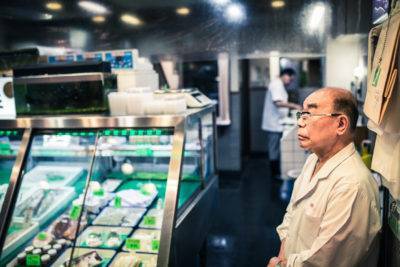 My assignment did not start until late afternoon so I took a stroll through a nearby Nishiki Market. It was full bizarre foods and fascinating people. I would also like to that this guy for coming on the adventure it was and being an awesome right hand man! Had to literally fight the geiko woman off of him throughout the night! 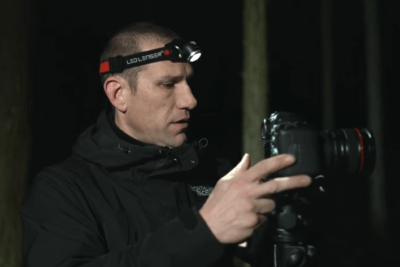 Have you ever tried capturing light trails from fireflies? If you have not you should definitely give it a try. 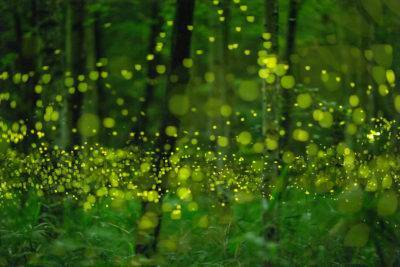 Fireflies are found in certain areas of Japan, where I live, and in other places around the globe. They are 2 species found in Japan, Genji and Hime. Today is the big day! 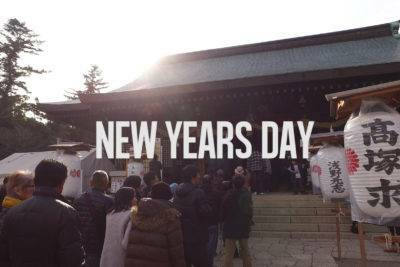 Today is Saidaiji Eyo Hadaka Matsuri or known to Westerners as the Naked Man Festival. It is an exciting and unique event with a long history. Today is also the day we take on a big assignment for Getty Images News. We don’t shoot news often so when we do get an assignment we are always very excited about it. This year we were asked to also cover some of the events that precede the main festival to show the complete story to the world. Another exciting dynamic to this year is we are also supplying video coverage to the news wire. This will be our first assignment where we need to provide both stills and video. 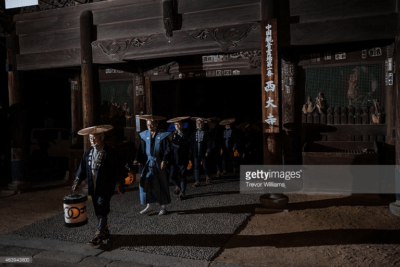 In a nutshell, a team from Saidaiji, where the festival takes place, goes on a 8km journey in silence in the dark of night to collect a piece of wood freshly cut by priests from a neighboring temple. That wood is brought back to Saidaiji and carved into a lucky talisman. The talisman is then prayed upon twice a day for two weeks before the festival by the priests at Saidaiji. Finally, the lucky talisman is tossed out into a crowd in pitch darkness which takes place today. The person who can get it out of the temple gate will be blessed with luck for the year as well as receive some traditional goods. Be sure to come check back tomorrow for the event pics! The full set of images can be seen here. 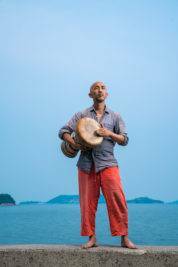 Coverage from the 2014 festival can be seen here. Shutter releases! What’s the deal? Too long that it hangs down by your feet but too short to use as a regular remote for when you need to be in the picture. I don’t get it. Who chose this length? It just dangles around in the dark just above ground level. Our new “flycam flowline” (cheap knock off of the easyrig) arrived this morning so I took it out for a quick spin. In terms of what kit I’m using here, this was the dji ronin, with a blackmagic production 4k and a Samyang 14mm Cine lens. On top of the camera is a sdi to hdmi converter that sends a 1080 image to the Blackpearl monitor. First impressions; to be honest I didn’t hold out much hope for the flowline as I thought it’d just be a cheap copy of the real thing, but actually it’s not that bad. 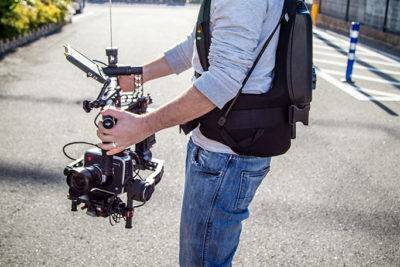 It’s somewhat comfortable and it does what it claims to, it takes the weight off of your arms whilst carrying the ronin. I’m used to wearing a steadicam vest for long periods, so for me I’m used to the weight being on my hips so I don’t mind that at all. But I’m sure for some at first it might be a strange sensation. Because of the weight of the rig it tends to sit at waist level without any assistance. For higher shots where the camera is at head height you will have to take some of the weight into you arms but compared to holding it there without the rig it’s much easier. At the lowest point the camera will reach to my shins, and can easily skim the floor if I cushion my steps as I walk. The flowline does feel a little plasticy and its a little bit scary to go handsfree and trust it fully to support the full weight. But for 1/3 of the price of the easyrig it’s a good interim solution until we can afford the other. It clips onto the handle with a spring loaded clamp which seems for now to grip ok, my concern is that over time it will lose some of the tension and slip. So I would always keep a hand on the ronin just incase I need to make an emergency catch. I also have a similar reservation about the cord that takes the weight of the ronin. But if that happens then I’m sure using the back piece and arm we’d be able to fashion something else to help take the weight. So for now I think it was worth it. I’ll update more as I get more use with it. We’ve got a shoot later this week where we’ll be able to give it a real world test and see just how well it handles. Over the coming days and weeks we’ll start to upload a few sequences that were shot using this set up so you can see exactly what it’s capable of. Remember to follow us on Facebook to keep up to date with Tdubphoto. 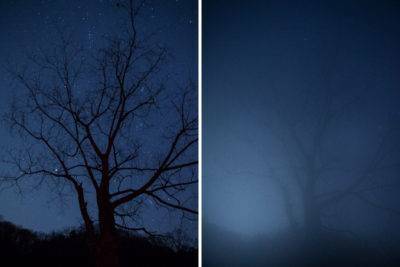 At certain times of the year lens fog and even ice can be a real problem when photography at night. 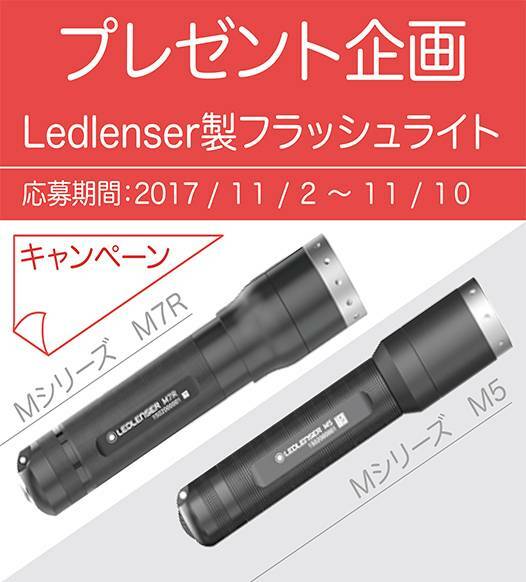 Of course, this is going to vary depending on where in the world you are located, but here in Japan it is almost all year. Especially when the camera is left to time lapse the night sky. We will be coming to Okinawa to look for photographers and videographers interested in making money through licensing their content through stock photography with iStock.